SkiBike Tour 2009-10 - Combien Sa Coute? I got somewhat heading to Arcalis and ended up in a loop going around Escaldes looking for the correct turning. A piste map is not the best tool for navigating by road, I realised that the turning for the valley leading to Arcalis is accessed from La Massana, but signposted for Ordino. As a result I met up with Joan later than planned, a little after 9:30. We immediately headed up to Les Portelles using La Bassera chairlift but were immediately stopped by piste patrol who insisted that a leash was worn between ourselves and our skibikes. This was the first time I have had to use such an arrangement and although it might in theory save someone from a runaway skibike, the skibiker would be much more likely to injure themselves in a minor spill. I had a length of lightweight and springy rope in my rucksack and improvised a suitable fixing. We tried El Tunel/La Coma runs and took the opportunity to make some videos and get photographs. The nearby La Basera green run was much too flat, I was able to scoot part of the way, but poor Joan on his weightier contraption looked quite worn out after much pedalling. Joan had to leave early to return to Barcelona so we took a quick break, discussed some ideas on how to develop a K-Trax skibike to be more downhill friendly, then parted company. 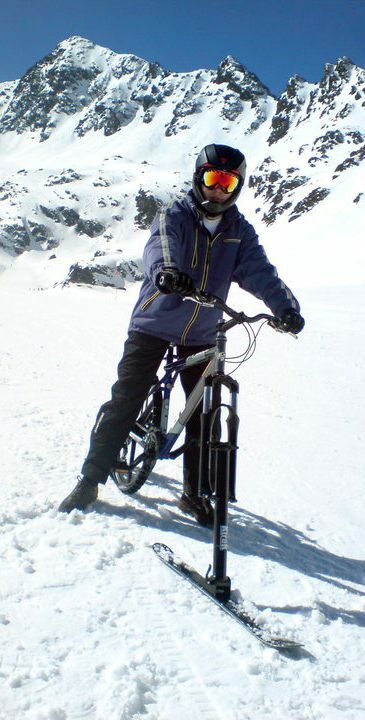 I headed back up to Les Portelles and one of the lift operators wanted to see my skibike, he seemed to be surprised at how light it was, I asked if he wanted to try it. Behind his station there was a short slope, he strode to the top, jumped on and slid back down. "How do I make it turn?" he asked, with body language I demonstrated the "English Ski Turn" which is to throw your bum out in the opposite direction to the way you want to turn. Once again he pushed the bike up the slope, jumped on, got up some speed and pulled a near perfect 180 degree turn. He climbed off wearing a huge grin....he'd got it. Moving on, I tried the fantastic La Portella del Mig run, one of the most exciting, challenging and varied runs ever and later the La Balma run. Back down at Arcalis, I then tried the L'Abalsetar chairlift for an exploration of La Font/El Bosc/L'Hortell and L'Estadi runs. I called it a day around 4:30 by which time the snow was heavy slush just about everywhere.